Anemia may be defined as a condition in which there is a decrease in the quantity of haemoglobin or in the number of red cells. 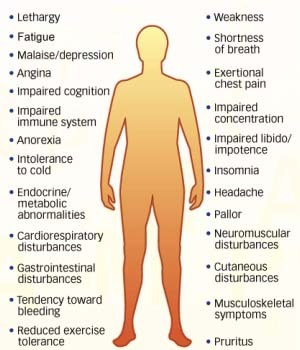 Anemia is among the most common ailments affecting human beings. 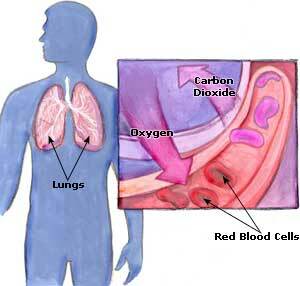 Nearly half the blood flowing in our veins and arteries consists of red blood cells which carry oxygen to the tissues. 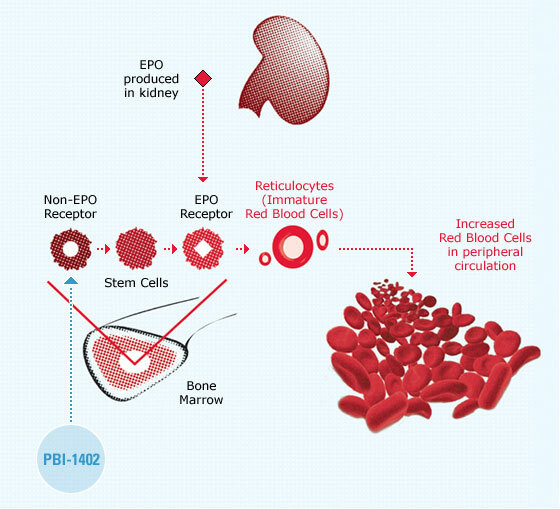 Approximately one trillion or 100 million new blood cells are formed daily in the bone marrow. The raw materials required in the production of these cells are iron, proteins, and vitamins, especially folic acid and B12. Of these, iron and proteins are essential in building up the red coloring matter called haemoglobin. A red cell has a lifespan of approximately one hundred and twenty days and is then destroyed and replaced. Each person should have about 15 gm of haemoglobin per 100 ml of blood, and a blood count of approximately five million red cells per millimetre of blood. The patient usually complains of weakness, fatigue, lack of energy and dizziness. Other symptoms include a haggard look, premature wrinkles, dull and tired looking eyes, poor memory, shortness of breath on exertion, headache, slow healing of wounds, and palpitations. The skin and mucous membranes look pale. Iron deficiency anemia symptoms and treatment can vary from case to case but bruising and hair loss are extremely common anemia related problems. This is because the inadequate supply of oxygen to the cells of the skin results in slower healing and so bruising is one of the side effects of anemia. In the same manner, the roots of the hair receive less oxygen as well and so they are considerably weakened. Topical applications and other such methods of hair loss treatment may not have any effect and it will be necessary to treat the root cause of the problem- the anemia, in order to prevent hair fall. 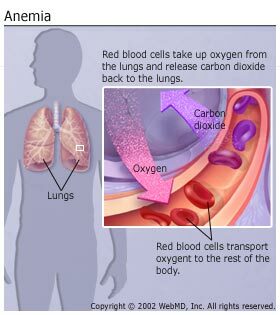 Anemia often causes the skin on the extremities to remain cold and clammy. The skin on the palms and soles of a person suffering from anemia will generally appear pale. Symptoms of anemia in women may be more severe as compared to men. This is due to the regular loss of blood during menstruation which aggravates the condition. Anemia in women, especially during pregnancy, is a very common problem and immediate dietary changes would help treat this condition. Signs and symptoms of anemia during pregnancy include breathlessness and giddiness. Keep in mind that the symptoms of anemia in women are very different from those seen in infants and children. A diminished formation of red blood cells in the bone marrow, either due to defects in the bone marrow, or due to an inadequate intake of iron, vitamins, and proteins, is one of the main causes of anemia. Other important causes are heavy loss of blood due to injury, bleeding piles, or excessive menstruation in women. Anemia can also occur due to a lack of hydrochloric acid in the stomach, which is needed for digestion of iron and proteins, or intestinal parasites or worms. Hookworms, pinworms, round worms and tape worms feed on the supply of blood as well as on the vitamins. This is one of the most common causes of anemia in infants and children. Anemia in children symptoms are not always noticeable and so it is advisable that regular check-ups be conducted to avoid further conditions from occurring. 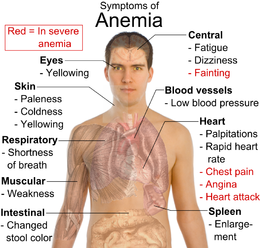 Anemia caused by a lack of adequate iron in a person’s diet is a very common problem. Iron deficiency anemia is considered to be the most common form of anemia and tends to affect women more than men. Iron deficiency anemia symptoms in women, infants, and children are more noticeable than iron deficiency anemia symptoms in men. The lower levels of iron in a person’s body results in lower levels of hemoglobin as it contains iron. 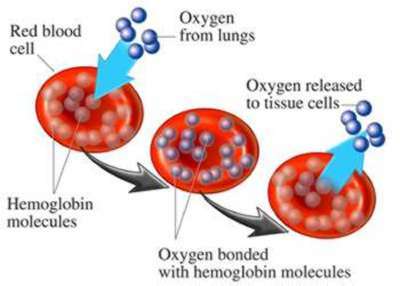 Hemoglobin is extremely important as it transports oxygen from the lungs to various parts of the body. This is why people who suffer from anemia often experience cold extremities. In recent years, the increasing incidence of obesity and unhealthy eating habits has been considered to be one of the main causes of iron deficiency anemia in men. The availability of junk foods coupled with increased snacking, binging, and other unhealthy eating habits has also been linked to several nutritional deficiencies in children and adolescents. 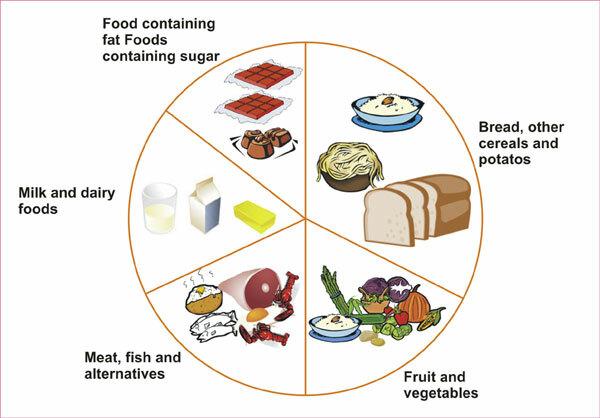 If a child is suspected of suffering from anemia or if he/she has been diagnosed as having iron deficiency anemia, it would be necessary to include plenty of iron rich foods for anemia in the child’s diet to help treat this condition. Iron deficiency anemia is a temporary condition and dietary changes are generally sufficient to treat and prevent the condition. Sickle-cell anemia is also referred to as sickle cell disease and it is a genetic blood disorder that results in the restriction of blood flow to the various organs of the body. The decreased blood flow can cause several health related conditions including organ damage and failure as well as necrosis. If this condition is diagnosed during childhood, dietary changes and lifestyle changes will help to minimize the damage caused by this condition. It is important to explain to the child what causes sickle cell anemia and the methods that he/she can employ to help reduce the severity of the symptoms. This will help the child to understand that the condition has not occurred through any fault of his own and that he will experience symptoms like pain, aches, or cramps and that he must inform you of any such symptoms right away. The treatment of sickle cell anemia generally consists of ways to minimize the symptoms as this is a genetic condition and so ongoing treatment is necessary. Vitamin B12 is needed for preventing or curing anaemia. This vitamin is usually found in animal protein, especially in meats such as kidney and liver. There are, however, other equally good sources of vitamin BI2 such as dairy products which also contain some B12 . Beets are very helpful in curing anaemia. Beet juice contains potassium, phosphorus, calcium, sulphur, iodine, iron, copper, carbohydrates, protein, fat, vitamins B1 B2, B6, niacin, and vitamin P. With their high iron content, beets help in the formation of red blood cells. The juice of red beet strengthens the body's powers of resistance and has proved to be an excellent remedy for anaemia, especially for children and teenagers, where other blood-forming remedies have failed. The leaves of fenugreek help in blood formation. The cooked leaves should be taken by adolescent girls to prevent anaemia, which may occur due to the onset of puberty and menstruation. The seeds of fenugreek are also a valuable cure for anaemia, being rich in iron. Lettuce is another effective remedy for this ailment as it contains a considerable amount of iron. It can, therefore, be used as a good tonic food for anaemia. The iron in it is easily absorbed by the body. This leafy vegetable is a valuable source of high grade iron. After its absorption, it helps in the formation of haemoglobin and red blood cells. It is thus beneficial in building up the blood, and in the prevention and treatment of anaemia. Soyabean is rich in iron and also has a high protein value. As most anaemic patients usually also suffer from a weak digestion, it should be given to them in a very light form, preferably in the form of milk, which can be easily digested. Almonds contain copper to the extent of 1.15 mg per 100 gm. The copper along with iron and vitamins, acts as a catalyst in the synthesis of haemoglobin. Almonds are, therefore, a useful remedy for anaemia. Seven almonds should be soaked in water for about two hours and ground into a paste after removing the thin red skin. This paste may be eaten once daily in the morning for three months. Honey is remarkable for building haemoglobin in the body. This is largely due to the iron, copper, and manganese contained in it. Raw honey should not be given to infants and toddlers who have been diagnosed with anemia. This is because raw honey contains certain bacterial spores that can cause a severe condition called botulism in kids. In order to add honey to an older child’s diet, you can use it as a substitute for sugar in their bowl of cereal every morning. You can also use honey in other dishes and even baked products as honey is resistant to high temperatures. You can even use honey in salads to add a bit of flavor and variety as well as increase the nutritional value of the salad. There are several other foods which are rich sources of iron and can be used beneficially in the treatment of anaemia. The more important of these are bananas, black grapes, plums, strawberries, raisins, onions, squash, carrots, radish, celery, and tomatoes. Diet is of utmost importance in the treatment of anaemia. Refined foods like white bread, polished rice, sugar, and desserts rob the body of its much-needed iron. Iron should preferably be taken in its natural organic form in food. The emphasis in the diet should be on raw vegetables and fresh fruits which are rich in iron. Eliminate junk foods from your diet, especially fried foods as these foods are high in calories but very low in their nutritional value. Bakery products too are extremely unhealthy as they contain plenty of processed fats, sugars, and flour. Substitute regular polished rice with unpolished rice as far as possible. Cold water baths are recommended in anaemia. The patient should be given a cold bath carefully twice daily, the coldness of the water being increased gradually. A hot Epsom salts bath for five to ten minutes once a week and an occasional steam bath are also useful. Sunbaths are especially beneficial as the sunlight stimulates the production of red cells. Other important factors that help in curing anaemia are deep breathing and light exercises like walking. Yogic asanas such as sarvangasana paschimottanasana and shavasana as well as massage are also helpfu1 in this regard.